Oshkosh Corporation is a global manufacturing company that designs and builds the world’s toughest specialty trucks, truck bodies and access equipment. A Fortune 500 company with manufacturing operations on four continents, its products are recognized around the world for quality, durability and innovation. Over the years, project leaders recognized that Oshkosh was good at building solutions to address business opportunities but could improve its approach to end-user adoption. After a few major initiatives encountered program restarts, there was a realization that in order for change to flourish, people must be engaged in change along the way, not just at the end. This recognition paved the way for a formalized change management approach. Since 2013, dedicated resources have taken the application of change management from one-project-at-a-time to integrating change management practices within existing methodologies (IT PMO, Lean/Six Sigma) and teaching team members how to lead and engage in change throughout Oshkosh Corporation. Prosci’s approach to change management fosters end-user engagement, positioning managers to lead their people through change by engaging the intuitive ADKAR Model. This flexible, scalable methodology has been a game changer. The synergistic partnership with Prosci and their innovative edge supports the journey of change management capability. To harness the change management capability and momentum generated by a large process transformation initiative to create and socialize a formal internal change management practice. In 2013, the change management team had a few Prosci-certified change management practitioners, but they recognized the need for additional change management tools and training with the flexibility to customize and cobrand. So the change management team acquired a license to the Prosci methodology and sent two of their team members through the Prosci Train-the-Trainer Program. The change management team began meeting with project managers of medium- to high-risk projects to understand the scope and scale of the change management efforts needed by these projects. They recognized that some project managers were hesitant to add change management to their work. And they identified that many of these projects were already past design and into or about to start implementation. These realities heavily influenced how the change management team approached these meetings. The change management team asked project managers if they had any concerns about adoption or if they anticipated any resistance, using questions provided by the Prosci Change Management Certification Program. Recognizing that there wasn’t time in some of these projects for the robust five-part change management plan recommended by change management best practices, the change management team worked with project managers to create modified change management resources that were scaled to fit the project timeline and team capacity. At times this meant providing only a communication plan. As part of this project-by-project support, there was a recognition that the change management approach ushered in end-user engagement like never before. This success broke boundaries and enabled a partnership model between IT and the change management team, eventually leading to an integration of change management into the IT department’s project management office in 2015. Today, all IT projects require certain change management deliverables, and IT project managers are becoming more and more familiar with change management and the role it plays in project success. Of the templates and resources that the change management team has leveraged in their work, one of the most useful has been the use of the Prosci ADKAR® Model. If a group’s ADKAR score is a three or lower, the project team knows to expect some resistance to the change. They use this metric as a trigger to further investigate what is keeping the group from embracing the change and how they can resolve it. Early conversations with employees also demonstrated to the change management team that employees are hungry for more communication. The change management team worked with project managers and resource managers to produce an increase in the frequency and timeliness of project communications across the business. A tangible result of this increased communication is being realized in fewer project restarts and delays. 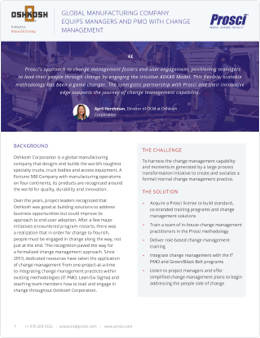 Read the full Oshkosh success story - including how the change team won over project managers - when you download the PDF. Oshkosh Corporation is a global manufacturing company that designs and builds the world’s toughest specialty trucks, truck bodies and access equipment.